Poet Gordon offers a thorough, occasionally whimsical, and hearteningly feminist take on the life of early Puritan pioneer and pundit Anne Bradstreet. The dutiful, extremely learned, favorite daughter of Puritan lawyer and steward Thomas Dudley of Lincolnshire, England, Anne Bradstreet was 18 when her entire family set out in 1630 to lead the Great Migration of Puritans into Massachusetts. Already married to Simon Bradstreet, a devoted, amiable assistant to her father, Anne was reluctant to leave the luxuries of England and did not immediately take to the punishing emigrant life in New England, where (once they survived the horrific trans-Atlantic crossing) many presently died of disease, cold, and malnutrition. But Dudley and his clan were on a godly mission to purge themselves of the corruption of the Old World, to separate from papist idolatry, and found the New Jerusalem—and they constantly moved to forge new Puritan strongholds, from newly founded Boston to Ipswich to Andover. In between bearing and caring for eight children, Anne turned her powerful intellect and encyclopedic knowledge to writing righteous poetry—an inadmissible and risky ambition for a woman in Puritan society, where the famous Anne Hutchinson herself had been drummed out for refusing to toe the theological line, as Gordon amply portrays. 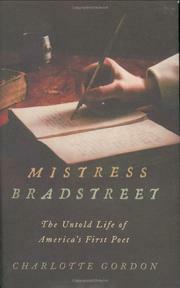 While the evidence depicts Bradstreet’s relationship with her husband as passionate, Simon remains a mystery, as Anne developed intense intellectual friendships with men of her circle who encouraged her writing, such as the preacher Nathaniel Ward and her brother-in-law John Woodbridge, who would take her manuscript of poems to England and have them published as the instant bestseller The Tenth Muse Lately Sprung Up in America. Gordon, a Boston Univ. doctoral fellow, devotes careful attention to the roots of Puritanism and to portrayals of its major players, such as John Cotton; her own sensitivity as a poet renders rapturous readings of Bradstreet’s writing.